At MACH 1 we have found several interesting ways to use the ball, including the obvious velocity of the pitch, but also the spin rate (rpm). We recently wrote a blog on spin rate and its relevance in helping develop pitches, grips to use, and hand movement at release. You can read that post here: ( Developing Pitches and Pitchers ) With the combination of the SmartBall/PitchTracker and its immediate feedback on spin rate, we can immediately begin to assess the relevant metrics. These metrics apply to each pitch and continue to help develop the pitch that’s being worked on. Another cool usage for us is the time to the plate measurement. Time to the plate is typically measured on a stopwatch by a coach. For a professional pitcher a time of 1.15 to 1.3s is pretty good, for a HS pitcher 1.25-1. 35s is sufficient. The reason this matters is that when you add the time to the plate for the pitcher, with the POP time of a catcher (The time it takes a catcher to throw the ball to 2nd base on a steal attempt) together, you then have the total time that your battery has to throw out a runner on a steal attempt. An above average HS base runner will go from 1st to 2nd in 3.4-3.5 seconds. So, if the pitcher/catcher combo time is 3.3 with an accurate throw you will get even the best runners out at 2B on a steal attempt. The challenge lots of young pitchers have is losing “stuff”, ie. velocity, location, and movement when they are trying to be quicker to the plate. PitchTracker gives us immediate feedback on their time to the plate, and their velocity. This gives us the ability to develop a “delivery that is quicker” without losing stuff based on the metrics we receive.The SmartBall and PitchTracker also have a bullpen charting section which is very useful. Inside that section is also a history for each pitchers bullpens. So, you can go back in time and see progress that was made, measure workloads etc. If you would like us to help in the development of your pitching repertoire let us know. We have lots of avenues to help you develop your game. “The statistical validation for 1st pitch strikes is irrefutable. 92.7% of first pitch strikes lead to an out or strike one; so that means that less than 8% of first pitch strikes become hits. 69% of strikeouts start with first pitch strikes and 70% of walks start with first pitch balls. Major league hitters hit .068 on first pitch strikes (total first pitch strikes which include foul balls, called strikes, & outs divided into hits). Major league pitchers throw approximately 57% first pitch strikes. They are capable of much better if we just look at the (3-0) strike percentage, which is 80%. This is extreme, but if a big league pitching staff improved their first pitch strike percentage from 57% to 80%, it would translate into one 100 fewer runs allowed over the course of a season. That translates into 10 more big league wins. There is a lot of focus on throwing two of the first three pitches for strikes. If you throw a first pitch strike, you have an 80% chance of throwing two of the first three pitches for strikes & if you throw a first pitch ball, your percentages fall to 30%. Once you throw a first pitch strike, your slash line falls to .239/.283/.372. The expected runs scored after a first pitch ball jumps to .069 runs vs .029 runs if you throw a first pitch strike. As long as it’s not a situational at bat, the key is to throw your highest percent quality strike pitch (or pitches) to your highest percent quality strike location. It’s critically important to have more than one pitch (ideally separated by ~10 MPH) that you can use on these 0-0 counts. If you would like help with getting that 0-0 pitch over the plate, or any other element of your pitching let us know. “This past off season I worked with MACH 1 and Dr. Tyler White to prepare for my college season. Dr. White helped me gain more mobility in my hips through trying to change my biomechanics. This was a huge help because in 2016 I had surgery on both hips. I worked with Dr. White two days a week for about 2-3 months. After the first couple weeks I could feel a noticeable difference in the way I felt and recovered. With the baseball season rapidly approaching, things can start to get busy with trying to juggle school, playing games, and still finding the time to practice and take care of their bodies. A lot of kids will start to find excuses for reasons not to train because they are “too busy”. 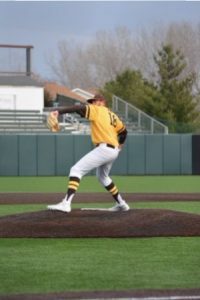 With most teams from the high school level and down, pitchers might not know they are pitching until the day before and sometimes not until the day of. That’s why developing a solid routine can help you always be prepared whenever your name is called upon to pitch. As most people know, the baseball season can be a grueling time both physically and mentally. Sleep, nutrition, and exercise are great ways to make sure your body can withstand the entirety of the season. Set yourself a schedule that includes at least 2-3 lifts a week, and a minimum of 8 hours of sleep. These are absolute musts in allowing the body to recover and maintain strength throughout the summer. With a lot of athletes spending the day at the field, sometimes the concession stand seems like the only place to eat. Packing yourself a healthy snack to eat in between games is highly recommended. Don’t be the guy who eats two hot dogs in between a double header on a 90 degree day and expects to go perform at a high level. If you know what days you’re going to lift, what you’re going to eat, and approximately what time to go to bed at night, suddenly the schedule will start to seem less hectic. While getting into a routine at home is extremely important, developing a routine at the field can keep things fun and help your mind be at ease when you are called on to contribute. The best thing about your preparation at the field is that you can choose what you want to do. Not everyone likes to get ready the same way. Between long toss, plyocare balls, bands, and weighted balls, find something before the game that gets you ready both mentally and physically. As a pitcher, you will find yourself in very stressful situations throughout the year. When these situations arise, knowing you have done everything in your power to prepare will help provide the confidence needed to achieve success in these moments. All of our athletes at Mach1 have worked extremely hard this offseason. Don’t let the start of the season be an excuse to stop working. Instead, use it as a mental edge against your opponent and know that you have put in the work and you are ready for anything. Good luck with the start of the season! PERFORMANCE RECOVERY- AN OXYMORON OR NEW AGE THOUGHT? One of the most underemphasized performance training strategies (right up there with performance nutrition) is RECOVERY. Many of the strategies listed below are from a lecture that Dr. Michael Tyman presented to our team last week. The full video is available at the link below if you want get introduced to some easy to implement concepts. It is important to note that we consider these strategies beneficial to our adult clients as well as our athletes. Emotional stress and physical stress have many of the same impacts on our bodies, these strategies will work well for all stressors placed on the body. For our student athletes, these tips will be super important for those of you going in-season. For our adult corporate athletes, we have no off-season, so these tips are immensely important to incorporate year-round. A very important equation: Stress + Rest = Growth. Keep this in mind and we will return to this thought. Limit exposure to blue light 2-3 hours before bedtime. Do not allow technology in your bedroom. Settings; display and brightness; night shift, sunset to sunrise and color temperature to warmer. Teenagers need between 10-12 hours of sleep. Adults 7 to 8 hours of sleep. Sleep in cool, dark bedrooms. The best athletes in the world prioritize their sleep as much as their training. There should be no guilt associated with prioritizing recovery- treat it as important as a workout. Our youth should be limited to no more than 2 hours of screen time per day. RECOVERY DAYS– a day off each week is warranted from training and practice, especially in-season. Recovery is also required from work. How do you know what is the best day to use for recovery? Stack heavy bouts of exercise or stress followed by a day of recovery. Recovery doesn’t mean lie on the couch all day- you can do something active that you enjoy in a relaxing manner. No training, no practice. Do something else that you enjoy and laugh while you do it. Watch the video below to learn about heart rate variability– a developing science which can tell us if the day should be a hard or easy workout day, or if it needs to be a full recovery day. Too many of us are muscling through extremely challenging workouts when our bodies haven’t recovered from the last one. LEARN TO BREATH CORRECTLY– with a meditative mindset (clear, relaxed, non-cluttered mind) find a comfortable, quiet place to sit. Inhale through your nose, hold for a four count, and exhale through your mouth. Do this for 5-10 breathes. You can use this breathing technique to set your mind, calm your nerves (before a meeting or on the mound between pitches). PERFORMANCE NUTRITION- nutrition and sleep are probably the two most underrated recovery and growth strategies. Without both, hard training is basically wasted, or at the very least, it isn’t realized to its fullest potential. For in-season athletes, maintaining your weight is critical and fueling every day is key. Do not skip breakfast- ever, even if you have an a.m. meeting or early tournament game. The best strategy here is to get a plan. Meet with a registered dietitian to lay out a nutrition fueling strategy that you like, can adhere to and fits your bodies unique needs. Hydration during the upcoming spring and summer will also impact your performance and recovery. Learn the signs of dehydration and avoid this pitfall. Thirst is a poor indicator of hydration status- it is a delayed response. TRAIN SMART– in-season training should be short bouts after practices- 30-40 minute total body workouts. Do not incorporate new exercises, exercises that induce soreness (such as negatives) and we’d prefer that you do not go to failure stopping 1-2 reps shy of this phenomenon when your muscles can no longer move the load. Failure is very taxing on the central nervous system and will further stress an athlete during a high-volume time of year. Going to failure is unnecessary to maintain strength and will only push us toward being overtrained which makes recovery more and more difficult. For our corporate athletes during heavy periods of stress, take a 20-minute walk outside when you get home- it will destress your body in unfathomable ways. CONDITION SPECIFIC TO YOUR GOAL– if you are a triathlete don’t expend your energy doing metabolic workouts- focus on your baseline strength and corrective exercises to prevent injury and spend the rest of your time training in your sports. Overtraining is common in marathoners and triathletes because they simply do too much and often eliciting the incorrect training response for their given activity. Our power-based athletes, such as baseball, do not need to run 5 miles, in fact, they shouldn’t- we aren’t training the right systems to benefit our sport and are just layering on more stress. In our world stress is stress- whether physical or mental and everybody is an athlete. So, we pull strategies that work for our adults and teach them to our student athletes and visa versa. These tips are inspired by a book titled Peak Performance by Brad Stulberg ad Steve Magness and summarize some of Dr. Michael Tyman’s thoughts from the lecture below. We look forward to introducing more recovery strategies and quick solutions in upcoming blog articles. In closing, rethink the following equation: STRESS + REST = GROWTH. Are you balancing stress and rest enough to achieve growth? If not, what can you do today to get starting improving your recovery?